Overseeding - Dowco Enterprises, Inc. Introducing new grass seed will fill in bare or thin areas as well as thickening existing turf. The best defense against weeds, drought and disease is a thick, lush turf. Over time, grass plants reach their peak and need to be replaced. Different factors contribute to the break down of the grass including foot traffic, heat, lack of water, environmental conditions, pet waste, etc. When is the appropriate time to overseed? The best time to over-seed is in the fall. Mother Nature provides us with more precipitation and cooler weather, diseases are less active, and the soil is still warm. Does spring overseeding produce satisfactory results? Spring is the time to apply pre-emergents and your desirable grass seeds typically lose the battle against pre-emergents. Aerating is an important factor prior to over-seeding and the aeration will break the barrier provided by the crabgrass pre-emergent. Additionally, the seedlings often do not have enough time to reach maturity before the heat of the summer hits. Click here to read more about spring vs. fall seeding. What type of seed should I use in St. Louis? The majority of lawns in the St. Louis area were installed with Bluegrass sod. 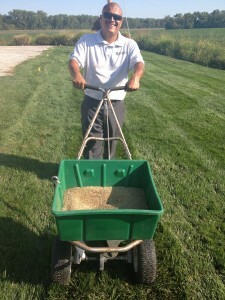 Introducing a Fescue blend will help to resist insects and disease. Fescue is proven to provide superior drought resistance, works well in sun and shade, and exhibits early spring green up. The Dowco Difference: Dowco will overseed with a high-quality tall Fescue blend seed which is drought tolerant, works excellent in sun & shade, and exhibits early spring green up. Dowco technicians will apply seed more generously in bare and trouble spots, typically located along the driveway or in high traffic areas. After aerating, Dowco will seed your entire grounds with at least 5 pounds of seed per thousand square feet which is a heavy rate.